OK, this is the first coincidence I’ve posted about so far that happened “Post Teapots” – just a couple of weeks after, I believe. My friend Rebekah was closely tied to the teapot happenings, since she was the best friend of my girlfriend (Jacque, who was with my in California during my mystical experience) and the girlfriend of my roommate (Mark, who had been the one taking photographs as I found the teapots beneath the stairs). Plus she’d had been there at the thrift store when I’d bought the first teapot. Shortly into the third game, I was drawing, Rebeckah was guessing, and the word was “dominos.” I hastily sketched a pair of dominos, knowing she’d have to get it very quickly to beat the other teams to the punch. Almost immediately she had a curious reaction – her face flushed bright red and she had a hard time getting the word “dominos” blurted out. 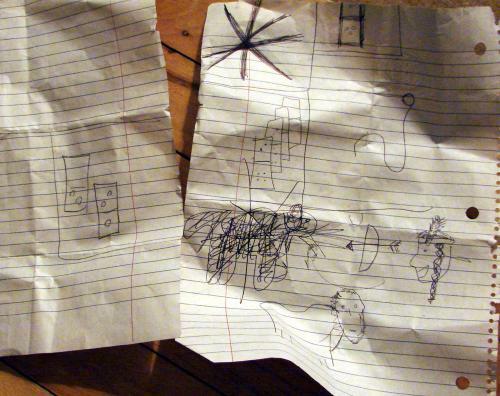 (the other drawings on the page are from other rounds of pictionary or by other people – the dominos are the only non-directed drawings that she did). Later – maybe that same day, maybe the next day, we went to the thrift store – for the first time since the time I’d bought the teapot. It was a large store – I think it was the Sun Ray mall one on 94 – and we all got separated. I wandered alone for what seemed to me a surprising amount of time without seeing any of my friends. Finally, I looked up and discovered that Rebekah had come down the aisle from the other side. She also had been alone the entire time since we’d arrived, and I was the first of our party she’d run into since. In the spot where we met, we both looked up and saw that there was a plastic bag of dominos hanging in the aisle between us – and burst into laughter. Our laughter took on a somewhat different tone when the exact same thing happened the next two times we went to thrift stores, over the rest of that winter – wherever she and I met up in the store, there would be dominos right there with us. Love this one! Can we repost it on our blog?? We’ve got a second link up for you, to this site. I still wasn’t sure though, so I just sent her a text message asking her, and she confirmed it had actually happened three times – am editing the end of the psot to reflect this.